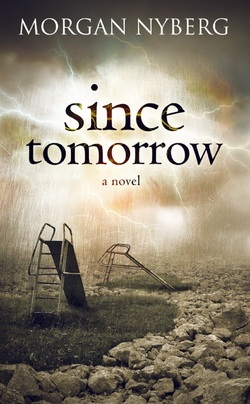 Since Tomorrow by Morgan Nyberg is dystopian novel set in Canada's west coast after an apocalyptic event fuelled by climate change and an earthquake which has led to economic meltdown has left Vancouver and the rest of world ruined. The world has been turned into a lawless society where food is valuable commodity as faction’s battle for territory. Dogs are used by the factions to protect their assets. The story is centres around an old man named Frost who can still remember a time before the world plundered into despair, Langley is after the town fuelled by his power generated by opium what grows and turns into skag, Skag is a valuable asset used as drug by many but also used as medication and in a world with no medical facilities the effects of skag become the difference between life and death. Frost has his family around him on his farm his son and his granddaughter Noor and a group of locals whom all contribute to the running of the farm, the group have lived in relative peace until now, Langley has slowly built an army and is intent on taking Langley's farm from him but the old man knows that the only way to stop that from happening is to end this once and for all of the world is move into a move optimistic future for all. Nyberg's novel is very very deep as it brings the characters together but I found Since Tomorrow heavy going in places and it took me a while to read this book, I found myself reading it in fits and starts. The story is well written but I have read better books in this genre, in fact if you’re a regular reader of my website you'll know what book I am talking about. All that said this is still a good story that leaves the reader emotionally disturbed at the thought this nightmare scenario could become reality if we continue to take what we have for granted.